Georges Rouault was a French painter, draughtsman, and printer, whose work is often associated with Fauvism and Expressionism. From 1895 on, he took part in major public exhibitions, notably the Salon d’Automne. In 1907, Rouault commenced a series of paintings dedicated to courts, clowns and prostitutes. These paintings are interpreted as moral and social criticism. He became attracted to Spiritualism and the dramatic existentialism of the philosopher Jacques Maritain. 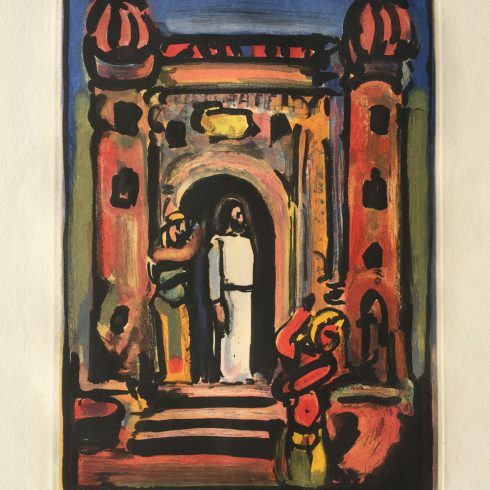 Our Fine Art Gallery has the finest quality Georges Rouault original prints, lithographs, etching and aquatints. We have a large inventory available off-site and we encourage you to make an appointment to see specific works you are looking to collect. We are happy to meet you at either our art gallery showroom or at your home or office for a private presentation. French painter, draughtsman, printmaker and designer, Georges Rouault created a personal style of Expressionism that gives him a highly distinctive place in Modern Art. Rouault was born in 1871, in the cellar of a house in Belleville, a working class quarter of Paris near the Père Lachaise cemetery, while the city was being bombarded by government troops quelling the Paris Commune. His father was a finisher and varnisher of pianos at a local factory. Rouault’s grandfather was an amateur art collector who bought engravings, lithographs and Rembrandt painting reproductions. 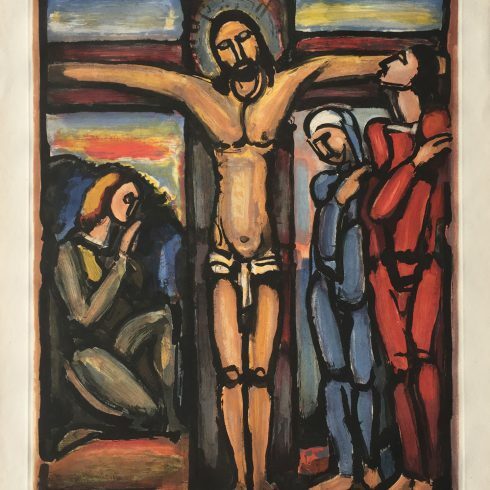 From 1885 to 1890 Rouault was apprenticed to a stained glass maker, his work included the restoration of medieval glass; the vivid colors and strong outlines characteristic of the medium left a powerful imprint on his work. In 1891 he entered the Ecole des Beaux-Arts, where with Matisse, he was a pupil of Symbolist painter Gustave Moreau, a brilliant and sympathetic teacher. Rouault was Moreau’s favorite student and he became the first curator of the Musée Moreau which opened in Paris in 1903. In 1902 Rouault helped to found the Salon d’Automne, an independant exhibition for those artists rejected by the official Paris Salon, where he showed alongside the Fauves. Although Rouault associated with Matisse and the Fauves, he did not adopt their brilliant colors or their typical subjects; instead he painted characters such as clowns, acrobats, dancers, outcasts and judges in jewel-like colors outlined in thick black lines reminiscent of Vincent Van Gogh. His sympathies were for the poor and downtrodden, and he commented that his imagination was stimulated by “the contrast between brilliant, scintillating things intended to amuse and this infinitely sad life.” In 1894 he was awarded the first prize at the Concours Chenavard and, in 1910, Rouault would have his first one man show at Galerie Drouet in Paris. Rouault married Marthe le Sidaner, the sister of Impressionist painter Henri Le Sidaner, in 1908—they would have four children. Rouault’s achieved financial success after Ambroise Vollard became his art dealer-publisher in 1917 and he gained an international reputation through the 1930s. In 1937 he had his first American one-man show at Pierre Matisse Gallery in New York City and in 1938 the Museum of Modern Art held an exhibition of his graphic prints. Rouault adeptly worked in the various printmaking techniques of woodcuts, lithographs and etchings, often for book illustrations commissioned by Vollard. Rouault spent the last decade of his life working to achieve the high standard of perfection he had set for himself. After the sudden death of his dealer Vollard in 1939, Rouault eventually gained back some 400+ paintings from the estate, of which, he destroyed 315. Georges Rouault died on February 13, 1958 at the age of 87. He received the national honor of a state funeral.